Each collection starts with an image, an impression, a beautiful sunset or a memory. We keep our eyes wide open, all the time. All my designs are drawn by hand. 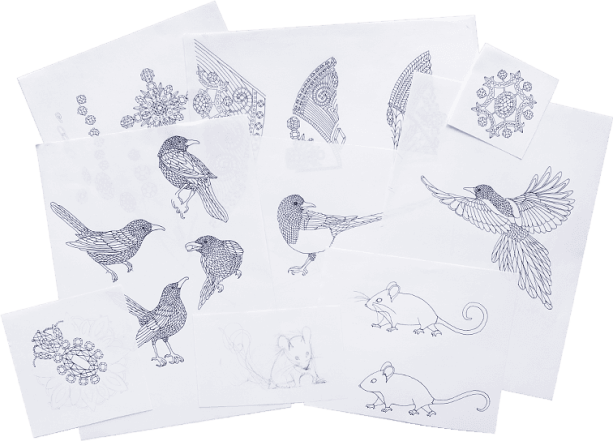 I'm old-fashioned: sketches are done in pencil before being finished in China ink on fine paper. I believe that the slightly irregular lines that result bring the drawing to life. And since I love precision, when it comes to finding THE right mouse, I can easily draw hundreds. 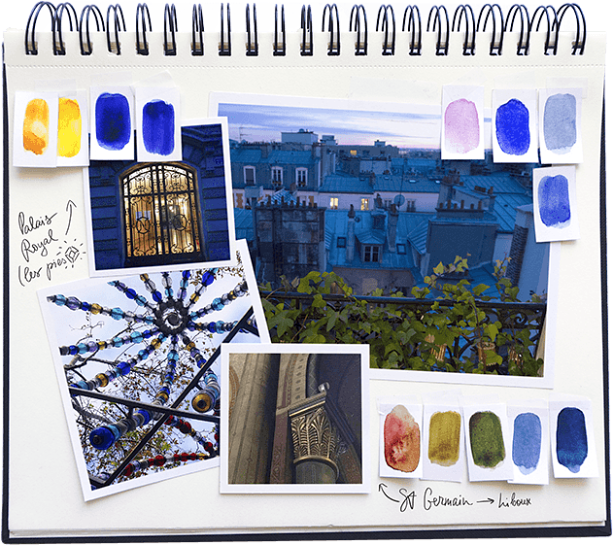 The range of colors used for the final print is inspired by miscellaneous scenes and ambiance of Paris. 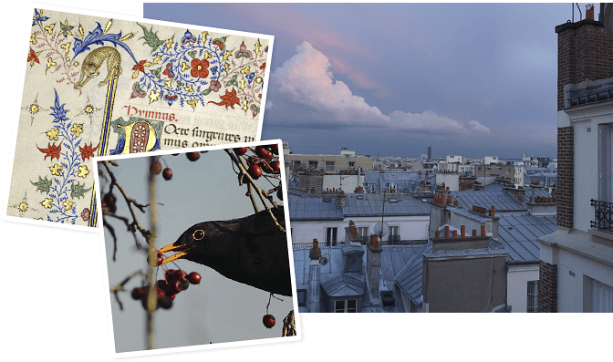 The columns of the Saint-Germain-des-Prés abbey, the reflection of a rainy sky in my Montmartre studio, the blackbirds in the garden of the Sacré-Coeur, an entrance at Palais Royal métro station, a nicely lit door towards Étoile, and of course, the Paris rooftops on a nice day, when it rains, at any time and any weather! All shawls and scarves are carefully printed in Switzerland. Yes, it takes time. Yes, it’s more expensive. But what they are meticulous! They are almost as obsessive as I am! In order for your shawl to really keep you warm and drape well, I add a lining. In addition to keeping you warm, this means your piece is reversible, turn it over to obtain more formal attire. All linings are selected with care. I love fabrics! Sometimes, I let myself fall in love with a color or material, sometimes I look for something more specific. 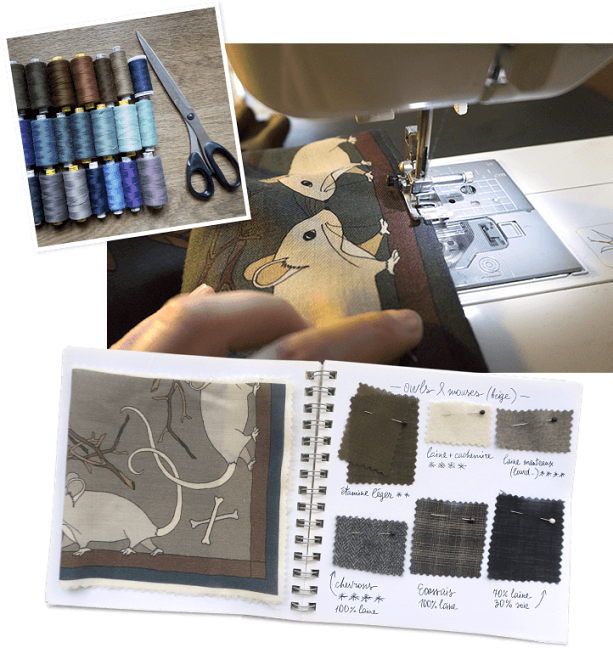 This allows me to offer you a wide range of linings, including wool and silk muslin, wool cheesecloths, incredible woollen Crêpe Georgette, and more. Each shawl is made to measure just for you. You’ll receive your shawl in a beautiful box with pretty ribbon, because it’s just as important to pamper yourself as your loved ones. I try to send my newsletter with a calendar and some news, once a month. If you haven't received it, either I'm late or I just running out of time.